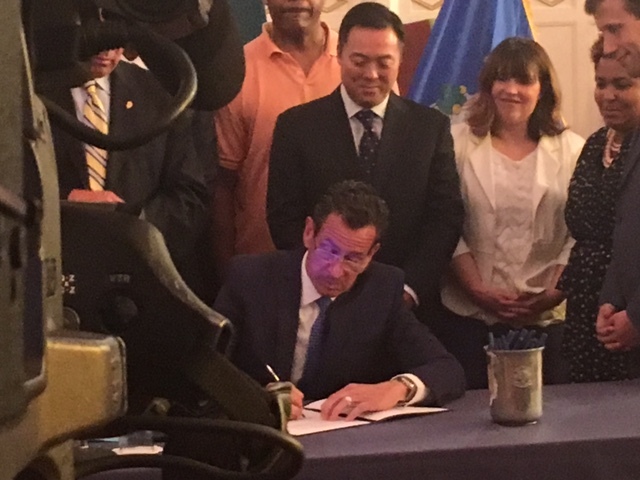 Flanked by community leaders, politicians and organizations across the political spectrum, Governor Dannel Malloy signed legislation to reform Connecticut’s criminal justice system on Wednesday at Faith Congregational Church in Hartford. The governor signed a total of nine bills, which included reforms to the pre-trial bail system, requiring a criminal conviction in order for the state to forfeit an individual’s assets, and allowing barbers and hairdressers to obtain a state license despite having a prior conviction. The governor was joined by both Republican and Democratic lawmakers, Hartford mayor Luke Bronin, community leaders and organizations such as the ACLU and the Yankee Institute for Public Policy. “Connecticut has gone from being a laggard in criminal justice reform to really being at the very forefront of criminal justice reform nationally,” Malloy said in his opening remarks. The bail reform bill will eliminate cash bail for non-violent offenders who are arrested for misdemeanor crimes and who would not face prison time even if convicted. Previously, those who could not afford a cash bail had to wait in jail until their trial, which could sometimes take months. Malloy cited the state’s declining crime rate and prison population as proof that Connecticut is making progress on crime, but said too many people are stuck in jail simply because they are too poor to make bail. He also pointed out that the issue adversely affects the Hispanic and African-American community. “The idea of our fellow citizens sitting in jail as a result of their inability to pay a bond was terribly unfair,” Malloy said. The governor cited one instance in which an individual could not afford a $1 cash bail. A 2016 study found that 3,400 people were held in Connecticut jails pending trial in 2015. Of those being held, 690 had a bond below $20,000, the lowest surety bond level allowable in the state. Offenses ranged from sixth-degree larceny to marijuana possession, although some were held for more serious offenses. The Office of Fiscal Analysis estimated the legislation would affect 388 people being held in pre-trial detention. The cost to taxpayers is $120.10 per day for each person, meaning the new law could potentially save Connecticut millions per year. 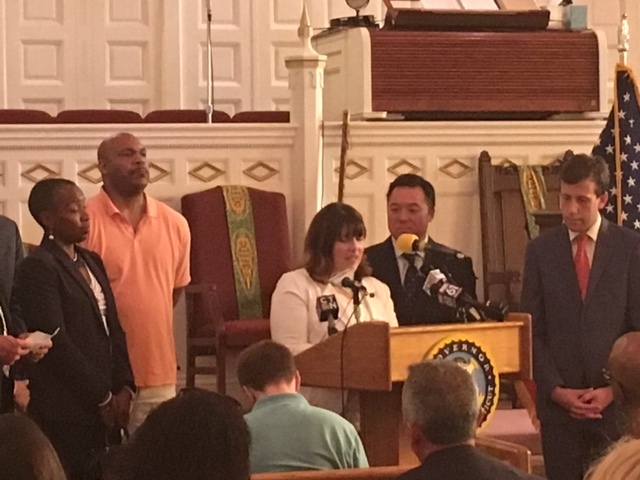 Among those speaking at the ceremonial signing was Yankee Institute director of public policy, Suzanne Bates, who had testified in support of a number of the criminal justice bills, including bail reform. The bail reform legislation drew the ire of bail bondsmen from across the state whose industry is affected by the change. The Bail Association of Connecticut testified against the bill claiming it was unnecessary and would potentially let those with multiple offenses back on the street. The bail reform bill received support from both political parties and garnered the large majority of votes in both the House and Senate. This bill released an extremely violent Sociopath with several violent incidents. Malloy should be in jail for this.